This year's Worlds demo is something practical: a robot that cuts shafts for you! A power hacksaw is testing the limits of the VEX hardware. Power tools need big motors and stiff, precise bearings: VEX 393 motors have a peak power of 35 watts, (At that power level they overheat and trip the internal polyfuse in seconds) and unlubricated plastic-on-steel bushings. The robot is basically just a hacksaw blade (clamped between two 1x2x1x35 c-channels) mounted to a crank. 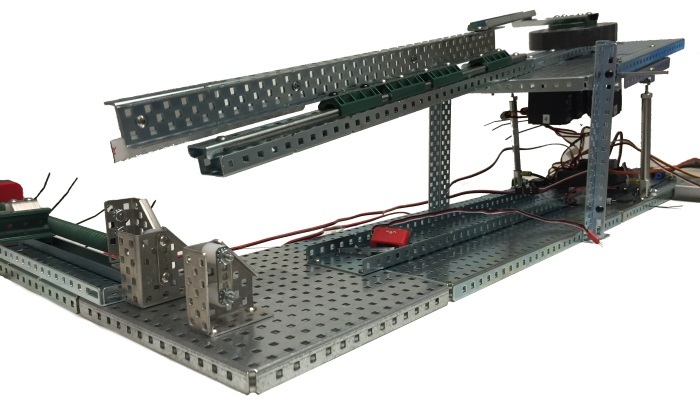 The linear part uses a linear motion kit with all four wide slide trucks mounted, and greased with Super Lube 21030. The rotational bit uses a turntable bearing packed with grease. The saw is powered by four 393 motors ganged together with standard gears, which have less friction than the high-strength versions. To use it you push a shaft through a set of four shaft bar locks until it hits the stop, then tell it what length you want it cut to. The shaft feed moves it to the correct position, a pair of pneumatic cylinders push the blade into the shaft, (using the same air compressor we used in the Pongbot from last year) and it starts cutting. Once it cuts through, the saw sled trips a limit switch, which retracts the saw, and then the shaft feed ejects the cut shaft. And that's it! The software half of the robot is uncomplicated, basically just turning motors on and off in response to user input. But we get that user input from the LCD buttons, which means UI code! UI programming tends to be tricky because it requires a little design, and a lot of input validation. You have to make sure the user can't wiggle the system into a bad state, which requires thinking very hard about how inputs affect everything. Let's do a quick, easy prototype, that also happens to be totally broken. This code works, in the sense that it will faithfully do exactly what the user commands. Unfortunately, you can keep pressing down forever until you get a negative number. FeedShaft won't do anything outrageously stupid if you give it a negative number①, but it'll quite happily run the shaft feed sled into the far end if you give it a large positive number. This disables the up and down buttons when we're at 1.875 and 6. But it leaves the button labels on the LCD, a false afforance that tricks the user into thinking they can keep going up or down, so let's fix that too. Note the implementation detail here: the length check in ChooseLength is <= 5.875, while the equivalent value in UpdateLCD is == 6. If it was 5.875 too, of course, then the up button would have its label removed one increment early, and be invisibly functional, an interesting example of an off-by-one error. And that's basically it! You can check out the full program here.